This article is about the British charity. For other uses, see Rambler. The Ramblers, formally known as The Ramblers' Association, is the largest walkers' rights organisation in Great Britain, and aims to represent the interests of walkers (or ramblers). It is a charity registered in England and Wales and in Scotland, with around 123,000 members. In 1931, the National Council of Ramblers' Federations was formed because walkers felt that a national body to represent their interests was needed. On 24 April 1932, the Communist-inspired British Workers' Sports Federation, frustrated at the lack of resolve of the newly formed Ramblers, staged a mass trespass of Kinder Scout, the highest point in the Peak District. During the mass trespass, the protesters present scuffled with the Duke of Devonshire's gamekeepers and five ramblers were arrested. The National Council of Ramblers' Federations did not endorse the tactics of the trespassers. This mass trespass is often seen as the pivotal turning point in the history of the Ramblers. In 1934 the Council decided to change its name, leading to the official founding of the Ramblers' Association on 1 January 1935. 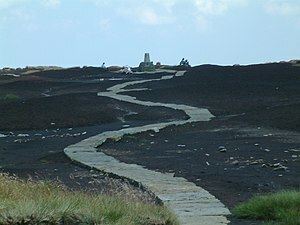 On 21 and 22 April 2007, the Ramblers celebrated the 75th anniversary of the illegal trespass of Kinder Scout and the imprisonment of those who participated. On 28 March 1946 the Ramblers' Association incorporated Ramblers' Association Services Limited, this was intended to operate as the commercial wing of the Ramblers' Association; specifically, to manage sales, to provide office services, establish guest houses and to organise walking tours for members at home and abroad. Ramblers' Association Services Ltd eventually became a separate entity from the Ramblers' Association, eventually becoming RWH Travel Ltd. From 1948 onwards its secretary was Tom Stephenson, who was a leading campaigner for open-country access and for the first British long-distance footpath, the Pennine Way. Labour politician Hugh Dalton, an avid outdoorsman, served a term as president of the Ramblers Association. Dalton was an environmentalist before the term came into fashion. As Chancellor in 1946 he started the National Land Fund to resource national parks, and in 1951 as Minister of Town and Country Planning he approved the Pennine Way, which involved the creation of seventy additional miles of rights of way. The Ramblers' Association and its members long felt that there was a need for a change of image following on from the last change in 1987. London-based brand agency Spencer du Bois, which specialises in not-for-profit organisations, was commissioned to create and effect the rebranding. It surveyed all members and received almost 6,000 responses, which revealed that there was a shift taking place within the membership, from elderly, retired, middle class and predominantly white members, walking in the countryside, towards a younger, more ethnically diverse membership for whom walking was an increasingly urban activity. The rebranding targeted this new and evolving demographic. In 2009, the Ramblers' Association was rebranded as the "Ramblers"; a new logo emerged incorporating a younger, more all-inclusive urban image. The Ramblers as a charitable organisation, which believes that walking can have a positive impact on people's lives, and that rambling in the countryside is a right and that it benefits the whole of British society. It also argues that Britain's network of public paths is an invaluable part of its national heritage and that the relevant authorities have a duty to invest in them. Since its inception, The Ramblers have campaigned for full rights of responsible access to all of Britain's green spaces, and this helped create the Countryside and Rights of Way Act 2000 (the CRoW Act). While access in Scotland had traditionally been more liberal than in other parts of the United Kingdom, the Land Reform (Scotland) Act 2003 extended these rights so as to make made Scotland, along with the Nordic countries, among the most walking-friendly countries in Europe, with walkers having the right to access virtually all land. There are 550 Ramblers groups in about 50 areas, and around 350 other affiliated bodies, such as societies especially interested in walking and pedestrianism, including the Footpath Society. Each area sends representatives to an area committee. Once a year a general council is held, whereby representatives from each area meet to discuss the priorities of The Ramblers for the forthcoming year. The trustees that are legally responsible for The Ramblers are also elected at this time. Ramblers' groups have been formed targeting specific age ranges, in particular people in their 20s and 30s, but more recently also the 40s and 50s, and this has helped in attracting new younger members. Increased emphasis on urban walking has also resulted in a number of specialised groups being formed, including the Metropolitan Walkers and London Strollers who specialise in short, leisurely urban, walks of under 8 miles (13 km). The organisation also hopes that such initiatives will also attract more members from ethnic and other minority groups. Another initiative is The Gay City Strollers, a collaboration between The Ramblers and the Lesbian and Gay Foundation of Manchester. The Ramblers receives most of its funding via membership and legacy income. In addition in recent years the Ramblers have won grants from other bodies including the government for running Walking for Health (a scheme to encourage walking for health purposes) jointly with the Macmillan Cancer Support charity and the Ramblers Holidays Charitable Trust for running Pathwatch. A long-term goal of the organisation was achieved in 2000 with the passing of The Countryside and Rights of Way Act, which grants the freedom to roam in the open countryside in England and Wales. The Ramblers has also been at the forefront of those campaigning for a consistent scheme of access to the whole coast of England and Wales (under the Marine and Coastal Access Act 2009) and for its implementation. The Ramblers have been successful in securing government funding in 2015 for the completion of the England Coast Path by 2020. Increasingly Ramblers volunteer teams help maintain footpaths across GB. The work in conjunction with local authorities has been encouraged and promoted by the organisation. This has helped the Pennine Way, the Pilgrims' Way, the Saxon Shore Way, Offa's Dyke, The Ridgeway and many others routes, as well as innumerable shorter paths. Along with the Long Distance Walkers Association, the Ramblers is recognised by Sport England as the governing body for "Rambling" in England. The Ramblers also actively monitor the level of funding cuts to highway authorities, as it is believed these will have a significant impact on footpath provision. In 2015 they launched The Big Pathwatch to examine the state of the path network in England and Wales. 3,250 volunteers conducted the survey recorded 59,000 problems. The results found 56% of footpaths were well-kept and signposted, 35% were in need of improvement and 9% were difficult or impossible to use with 46,000 photos taken of these issues. Countryside and Rights of Way Act introduced a limit for all unrecorded footpaths and bridleways created before 1949 to be recorded before 1 January 2026. The Ramblers is increasing its training of volunteers and offering advice and guidance on how to claim lost footpaths, and have launched a nationwide Don't Lose Your Way campaign. The Ramblers are active in promoting "walking for health" schemes (under its "Get Walking, Keep Walking" initiative). The Ramblers are opposing some planned Level Crossing closures where the diversion is not suitable, for example taking walkers on to roads without pavements. Throughout its history, the Ramblers have often been involved with other countryside user groups and landowners. A notable case involved Nicholas Van Hoogstraten, the millionaire property tycoon, has had a long-standing dislike of and dispute with Ramblers, describing them as "scum of the earth". In 1992 Hoogstraten erected a barn, a gate, barbed wire fince, and refrigerators across a footpath on his country estate in East Sussex. Local Ramblers staged a protest against the erection of the fence outside the boundary of Hoogstraten's estate. On 10 February 2003 and after a 13-year battle and numerous legal proceedings, the path was finally re-opened. Locally, walks vary in length: short distances of three to four miles (6 km); a medium range of five to six miles (10 km), or seven to nine miles (14 km); or for the more experienced ramblers, ten to fifteen miles (24 km). Consideration is given to the difficulty of the course and the terrain, whether stiles, steep hills, and busy roads are to be crossed, and the number of members who may be expected to take part. Ramblers take their turn in volunteering in advance for the list of leaders of the walks. Leaders walk out the designated route in order to reconnoitre it, bearing in mind that certain features of the route may change before the actual day of the walk. Crops in fields growing or harvested, foliage on trees changing, footpaths overgrowing—all will make a difference to what Ramblers will do. Lunch will normally be taken en route and may consist of a picnic or a lunch taken in a pub that welcomes Ramblers. The walk leader will be familiar with suitable pubs to visit before the walk. Many members of the Ramblers are not active members of a group however, but are members to support the access and advocacy work of the Association. Similarly, there are many members who are not users of long-distance paths, but are more interested in preserving the diversity of the existing footpath network. The majority of Ramblers will drive to the walk starting point, but car sharing is encouraged to lessen the environmental impact of car usage. ^ a b c "Ramblers Annual Report and Accounts 2008-09" (PDF). Rambler's Association. Archived from the original (PDF) on 9 July 2011. ^ "Vanessa Griffiths has been appointed our new Chief Executive". Ramblers. ^ a b c d e "About Us: Our history". The Ramblers. Archived from the original on 4 January 2012. Retrieved 3 April 2017. ^ "Celebrating 75 Years at the Heart of Walking". Ramblers. Archived from the original on 5 March 2012. Retrieved 25 September 2010. ^ Robertson, Bertie (1992). The Story of Ramblers' Association. Welwyn Garden City, Hertfordshire: Ramblers' Association Services Ltd. p. 7. ^ Hilton, Matthew; et al. (2012). A Historical Guide to NGOs in Britain: Charities, Civil Society and the Voluntary Sector since 1945. Palgrave Macmillan. p. 187. ^ "Rambling takes a walk on the wild side". The Independent. 2009-03-02. Retrieved 2018-12-20. ^ "Rebrand Q & A" (PDF). Ramblers. Archived from the original (PDF) on 20 February 2012. ^ "Letters: The Ramblers is a broad church". The Guardian. 2010-01-26. ISSN 0261-3077. Retrieved 2018-12-20. ^ "Ramblers to give name the boot". The Independent. 2000-10-15. Retrieved 2018-12-20. ^ Dickinson, Greg (2018-11-22). "How 'urban rambling' became an unlikely trend for millennials". The Telegraph. ISSN 0307-1235. Retrieved 2018-12-20. ^ "Get Walking with the Gay City Strollers". Ramblers. 23 April 2010. Archived from the original on 15 July 2010. Retrieved 3 April 2017. ^ Editor, Charles Clover, Environment (2006-06-02). "Right to roam all Britain's coastline". ISSN 0307-1235. Retrieved 2018-12-20. ^ "Views sought on coast path plans". 2007-06-19. Retrieved 2018-12-20. ^ Jamieson, Alastair (2010-08-02). "Coastal path round England threatened by spending cuts". ISSN 0307-1235. Retrieved 2018-12-20. ^ "One Coast For All: Campaign for the English Coastal Path". Ramblers. Archived from the original on 29 August 2012. Retrieved 3 April 2017. ^ "'Protecting our land is no longer a Government priority'". 2011-10-26. ISSN 0307-1235. Retrieved 2018-12-20. ^ "England Coast Path funding protected - Ramblers". www.ramblers.org.uk. Retrieved 2018-12-20. ^ "Public Footpaths: Coastal Areas:Written question - 17575". UK Parliament. Retrieved 2018-12-20. ^ "Which sports do we recognise?". Sport England. Archived from the original on 25 June 2011. Retrieved 30 March 2010. ^ "Campaign for National Trails". Ramblers. Archived from the original on 13 July 2012. Retrieved 3 April 2017. ^ Symcox, Jonathan (2013-11-25). "Ramblers stopped in tracks as council cuts lead to 100,000 unfixed problems on our public pathways". mirror. Retrieved 2018-12-20. ^ "Ramblers to survey condition of paths". BBC News. 2015-07-15. Retrieved 2018-12-20. ^ Shute, Joe (2016-12-07). "Right to roam? How Britain's country paths are disappearing". The Telegraph. ISSN 0307-1235. Retrieved 2018-12-20. ^ Bates, Dominic (2016-11-14). "Walking paths in England and Wales are a pattern of feast and famine | Dominic Bates". The Guardian. ISSN 0261-3077. Retrieved 2018-12-20. ^ Reporters, Telegraph (2016-11-14). "Thousands of miles of Britain's footpaths blocked for walkers, survey finds". The Telegraph. ISSN 0307-1235. Retrieved 2018-12-20. ^ Participation, Expert. "Countryside and Rights of Way Act 2000". www.legislation.gov.uk. Retrieved 2018-12-20. ^ "New plans to simplify recording rights of way". GOV.UK. Retrieved 2018-12-20. ^ Davies, Caroline (2015-12-25). "Countdown begins to prevent loss of thousands of footpaths and alleyways". The Guardian. ISSN 0261-3077. Retrieved 2018-12-20. ^ Rushby, Kevin (2018-12-04). "Memory lanes: the ramblers trying to save 10,000 lost footpaths". The Guardian. ISSN 0261-3077. Retrieved 2018-12-20. ^ "Don't Lose Your Way - 2026 - Ramblers". www.ramblers.org.uk. Retrieved 2018-12-20. ^ "Get Walking Keep Walking". The Ramblers. Archived from the original on 6 December 2013. Retrieved 2 December 2013. ^ "Network Rail - Ramblers". www.ramblers.org.uk. Retrieved 2018-12-20. ^ "Walking group set to fight for their right to ramble". Gazette. Retrieved 2018-12-20. ^ Millward, David (2002-11-21). "Court backs ramblers' right to cross land". ISSN 0307-1235. Retrieved 2018-12-20. ^ Millward, David (2003-02-11). "Hoogstraten's barricade falls to the ramblers". ISSN 0307-1235. Retrieved 2018-12-20. ^ Wilson, Jamie (2002-11-21). "Ramblers triumph on Hoogstraten path". The Guardian. ISSN 0261-3077. Retrieved 2018-12-20. ^ "Van Hoogstraten footpath finally cleared". 2003-03-02. Retrieved 2018-12-20. ^ Millward, David (2003-01-31). "Hoogstraten loses his battle with ramblers". ISSN 0307-1235. Retrieved 2018-12-20.